One of the most interesting sessions we attended during the ICE Atlanta e-commerce conference a few weeks ago was an open discussion centered around mobile apps and software services that helped online selling entrepreneurs focus on growing their business instead of struggling with the details. Don't get us wrong. The details are important, but struggling with managing those details can keep business owners from doing what they do best — selling. Basecamp: Project management software to track project discussions, files, and events from beginning to end—all in one place. CamScanner: Create PDF files by taking pictures of paper documents with your phone. Evernote: Evernote makes it easy to remember things big and small from your everyday life using your computer, phone, tablet and the web. Expensify: Import expenses, scan and save receipts, create expense reports, track mileage, analyze data, import into Quickbooks and more. FaxBurner: Use a smart phone to take pictures of a document and fax it. It's that simple. Plus, get your own fax number and have faxes sent to your email. Invoice2Go: Design, manage and send estimates and invoices wherever you are. LastPass: A password manager tool that manages passwords with one master password, provides form auto-fill, let's you share passwords with associates (without sharing important credentials), secures data and more. MailChimp Email Marketing: Design email newsletters, share them on social networks, integrate with services you already use, and track your results. Super easy to use and great design templates. ReplyManager Email Management: Manage inbound customer email, organize email into folders, tag them, send auto-responders and create customizable standard replies. I know we're tooting our own horn here. But hey, this is valuable stuff! Did we miss anything? Help us out. 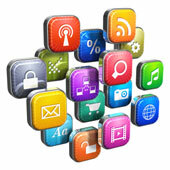 Leave a comment and tell us what apps work best for you.